I originally posted this on March 5, 2013. 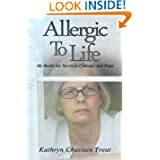 This is a topic that comes up all to often among those of us with chemical sensitivity or chronic illness. I decided it was time to share it once more on my Catch Up Mondays. Today I was honored to be listed among some other very good bloggers on Ichigo Ichie in her post on Human Canaries and Friendship. We all know that we are the canaries, the guinea pigs for finding what works/doesn’t work on our environmental illness and chemical sensitivities or other chronic invisible illnesses. We also know what it is like to lose friendships during our struggles to make our world safe and in search of improving our health. We also know how empowering it is to make new friendships with those who understand and will gladly lend a sympathic ear. I am now following this blog too. Dr. Rea once said that we are just the tip of the iceberg. One day, we will be the ones that are empowered, the ones with the knowledge, and everyone else will be beating down our doors for information and sympathy.